What is the REPT Function? The REPT Function is categorized under Logical functionsFunctionsList of the most important Excel functions for financial analysts. This cheat sheet covers 100s of functions that are critical to know as an Excel analyst. The function will repeat characters a given number of times. In financial analysisAnalysis of Financial StatementsHow to perform Analysis of Financial Statements. This guide will teach you to perform financial statement analysis of the income statement, balance sheet, and cash flow statement including margins, ratios, growth, liquiditiy, leverage, rates of return and profitability. 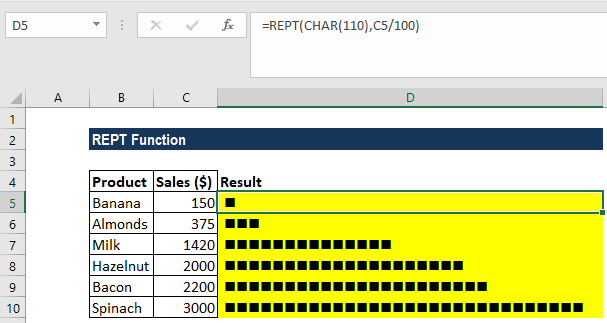 See examples and step-by-step instruction, we can use the REPT function to fill a cell or pad values to a certain length. We can also build histograms, a chart commonly used in financial modeling, using the function by translating values directly into a certain number of (repeated) characters. Text (required argument) – It is the text we want to repeat. Number_times (required argument) – It is the positive number that specifies the number of times to repeat text. 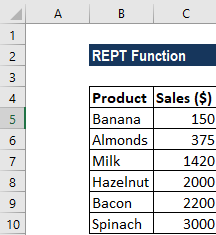 How to use the REPT Function in Excel? To create a simple in-cell histogram, we can use a formula based on the REPT function. It can be useful when we want to avoid the complexity of creating a separate chart. #VALUE! error – Occurs if the result of the REPT function is more than 32,767 characters long. If number_times is 0 (zero), REPT returns “” (empty text).